After the Great Fire of London in 1666, Sir Christopher Wren was commissioned to rebuild many of London's churches, including St. Paul's Cathedral. However, the first designs were deemed too radical and had he not been met by opposition, St. Paul's Cathedral could look a great deal different to how it looks now. There are many interesting things to view inside and outside the Cathedral, including the West Front which features the two imposing towers on either side of the Great West Door which is now only used on special occasions. 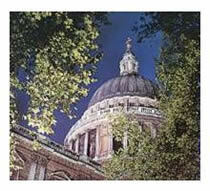 The Stone Gallery is an exterior viewing platform from which spectacular views of London can be seen. The dome is a magnificent piece of architecture and weighs a staggering 65,000 tonnes. Inside the dome is the Whispering Gallery which, due to its design, allows whispers to be heard from one side of the dome to the other.